Author’s Note: The purpose of this photo essay is to discuss the philosophical assumptions surrounding potential qualitative research methodologies that might be utilized to describe aesthetic competence and dance performance. It is a culmination of earlier work developed during my time in Dublin, Ireland while participating in a five-week study abroad program in collaboration with the University of Illinois at Chicago and University College Dublin during the summer of 2015. I had the pleasure of working with two undergraduate students on a qualitative research project related to sports psychology and dance. What we found were more similarities than differences, and a welcoming, inquisitive, innovative dance community in Dublin. What follows below is a culminating piece from this work, originally published on a University blog sponsored by the UIC Study Abroad Program and is presented on this site with some revisions and modifications. I arrived in Dublin at the beginning of June, 2015, with a group of UIC students to study sport and performance psychology. I came with a particular set of interests: aesthetic competence in concert dance performance, and how perceptions of performance potentially affect the way dancers train. Athletic achievement is quantified by winning the game, getting the gold medal, beating a personal best, etc. Aesthetic competence (AC) is a term used in performance to describe that which is not defined by fitness level or technique; rather, AC is related to overall quality of movement. Aesthetic sports like figure skating, synchronized swimming, and gymnastics share this term with dance, particularly competitive dance forms such as ballroom and ice dancing. The work of D. V. Knudson (2013) is foundational in describing and assessing qualitative aspects of movement, utilized in scoring systems across many aesthetic sports. Early AC studies on concert dancers (ballet and contemporary) borrowed models from aesthetic sports such as figure skating and gymnastics (Krasnow & Chatfield, 2009). While concert dancers and aesthetic athletes share similarities, however, the nature of concert dance as an inherently subjective art form makes it difficult to elucidate benchmarks by which one might measure a dancer’s performance. I am interested in investigating whether a set of attributes can universally define AC in concert dancers. While in Ireland, I met some of Dublin’s wonderful dance community members and “tried on” a number of potential qualitative methodologies that might be brought home as part of a larger body of work. John W. Creswell (2013) describes the importance of identifying underlying philosophical assumptions when conducting qualitative research. The work I conducted in Dublin was primarily ethnographic (the writing of culture), using methodological strategies that included observation, participant observation, interview, Visual Thinking Strategies (VTS), and grounded theory. 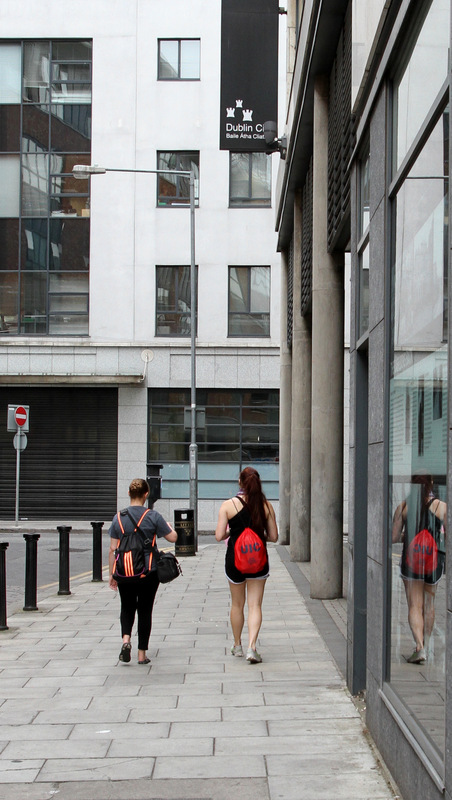 This photo essay addresses my personal assumptions specific to the qualitative study of dance performance, based on prior knowledge and experience, current literature on the topic, and this investigation in Dublin. 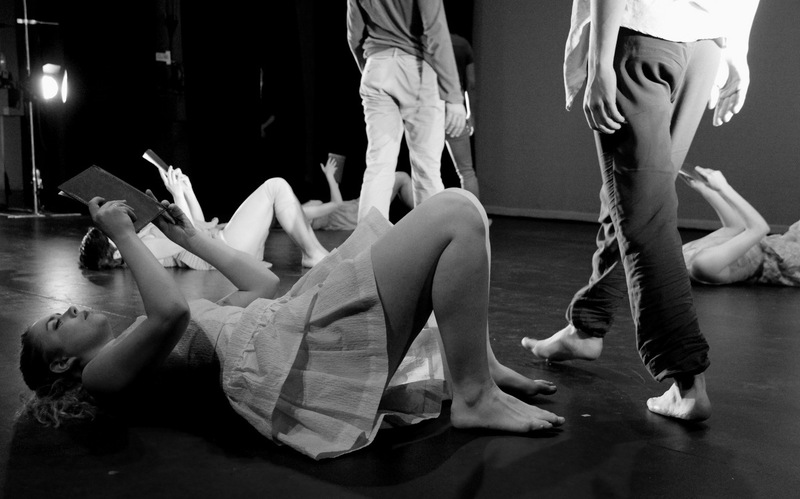 Work in Dublin consisted of collaborations with Dance Ireland, MeetShareDance, the Dublin Youth Dance Company, and Irish Modern Dance Theatre, in addition to interviews with a number of independent dance artists. Positivist Evidence-Base for Aesthetic Competence. Much of the literature regarding AC is positivist in nature, that is, it works from a philosophical assumption that “truth” is derived from empirical evidence by employing the scientific method. In an effort to uncover potential physiological variables associated with AC, Angioi, Metsios, Twitchett, Koutedakis, & Wyon (2009) tested the reliability of a rating scale developed by the authors through a systematic review of the literature (r = 0.96). Such a scale could be utilized to assess the quality of a dance performance, or whether a dancer is “good” or aesthetically pleasing to the viewer. According to Angioi et al.’s scale, the most reliable physical fitness correlate for AC in contemporary dancers was push-up test performance. The results of their study suggest a correlation between upper body muscular endurance, lower body power (measured through a push-up test and vertical jump test, respectively) and AC. Alignment/Posture: Sense of center, carriage of the body, maintenance of correct position in motion (Koutedakis & colleagues, 2007; Parrott, 1993). Clarity of movement intention: Amplitude of range of motion, whole body involvement. Also referred to as “spatial skills” or “spatial integrity,” this theme relates to the concepts of space, time, and energy described by Bartinieff Fundamentals and Laban Movement Analysis (Angioi et al., 2009; Chmelar & Fitt, 1991/1992; Chatfield & Byrnes, 1990; Krasnow & Chatfield, 2009; Parrott, 1993). Precision of movement/Articulation/Coordination: Balance and control, articulation of body segments, coordination, transitions between movements (Angioi et al., 2009; Koutedakis & colleagues, 2007; Parrott, 1993). Expressivity of the body: Appropriate use of bodyweight, energy, and facial expressions. Can also refer to dramatic range and the impression left on the audience (Angioi et al., 2009; Chmelar & Fitt, 1991/1992; Parrott, 1993; Pokora, 1988). Musicality: The ability of a dancer to demonstrate rhythm or musical precision and/or interpret a musical accompaniment (Angioi et al., 2009; Chmelar & Fitt, 1991/1992; Parrott, 1993). Technique: Angioi et al. (2009) define contemporary dance technique in terms of elevation, turning and falling, height of extensions, balance, placement, and posture. As such, it appears that technique is infused into nearly all of the above categories. Chmelar and Fitt (1991/1992), however, differentiate between performance and technique, defining technique parameters as including range of motion, explosive movements, endurance, and neurological components such as timing and coordination. Trusting Experience over Evidence. The benefit of positivist research is that it generates “rules”. In other words, were an experiment repeated under the same conditions, the results are likely to be the same and generalizable to a larger segment of society. The literature profiled above attempting to define AC and dance performance obeys this positivist paradigm. For competition dance and ballroom — forms that are judged and awarded a winner — it is probably beneficial to create a generalizable model for evaluating performance. In concert dance, however, value and quality are based on perception, and not necessarily determined by quantifiable attributes. Even assuming that concert dance can or should be generalized, no two dancers are the same, no two dances are the same, and no two audience members see dance in the same way. So, it becomes problematic to imagine that there is only one way to define “good” dance. Using qualitative methods admits and accepts that measuring dance is messy, and quite possibly too subjective to submit to a set of generalized standards of excellence. In light of this, I have utilized ethnography as a research approach — attempting to write the culture of dance from dancers’ point of view. 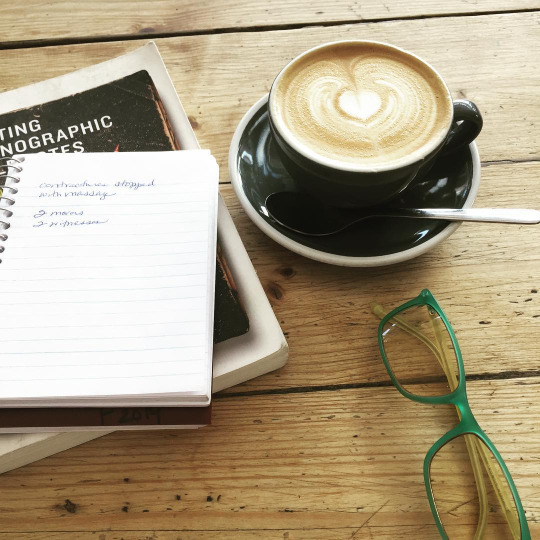 Using the Literature to Ground Ethnographic Research. The strength of ethnography in researching the health sciences has been described by Reeves, Kuper, & Hodges (2008), and Krane & Baird (2005). I arrived in Ireland set on conducting ethnographic research, but familiar with the themes presented by the literature and outlined above. In ethnography, everything is data. 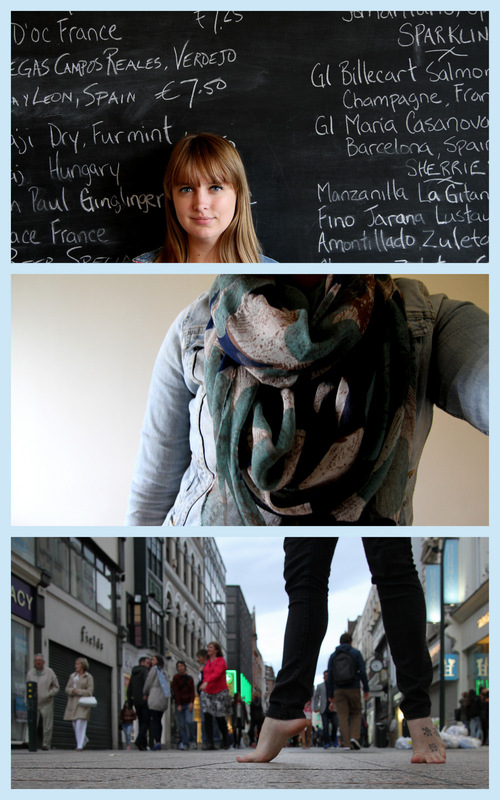 I recorded field notes on every dance-related experience I had in Dublin – from Kristina’s class with Toni Bravo, to the Dublin Youth Dance Company performance in Ballymun, to every coffee shop chat and social event, MeetShareDance, and a week-long intensive with Christine Kono-Pohlmann and Irish Modern Dance Theatre. I kept reflexive memos beside my field notes to acknowledge my personal reactions and biases and avoid mixing them into the data. With the mindset that I could strengthen the value of positivist literature by uncovering its patterns and themes of AC within my observations from the field, I began coding my notes according to the themes presented in the literature. As time progressed, I found that many of my notes were left blank – uncoded. In other words, I was looking for something that wasn’t there. Using Grounded Theory to Challenge the Literature. The “beauty” of fieldwork is that it rarely goes according to plan. Grounded Theory (GT) acknowledges this: one gets to investigate things as they are, not as one wants or expects them to be. 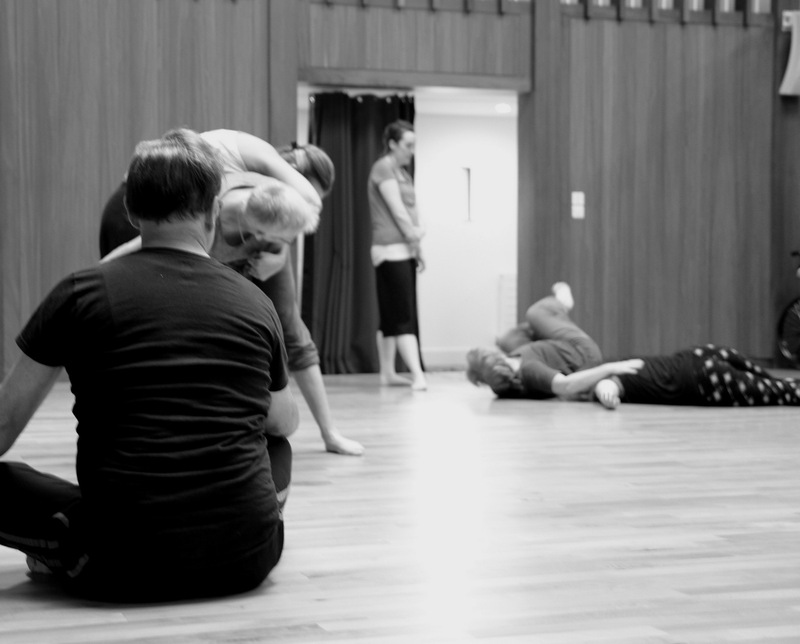 My time in Dublin reminded me to remain open – open to new lines of investigation, open to new perceptions of what dance is or can be, and open to possible themes that might arise out of the wide range of experiences I had there. GT is both a method of research and a theoretical viewpoint stating that theory emerges from the data. A GT Approach to Analyzing the Data. In their book Writing Ethnographic Fieldnotes, Emerson, Fretz, & Shaw (2011) discuss the utilization of GT when first analyzing ethnographic data. The authors suggest an “open coding” method on the first read-though. In other words, the researcher goes line by line through her field notes and reflexive journal, allowing themes to emerge from the data, rather than looking for something specific. In this way, she remains open to what is in front of her, rather than relying on epistomological assumptions. When I came to Ireland, I was focused on working with professional concert dancers. What was presented to me was a much broader and richer definition of “dancer” than the one with which I arrived. 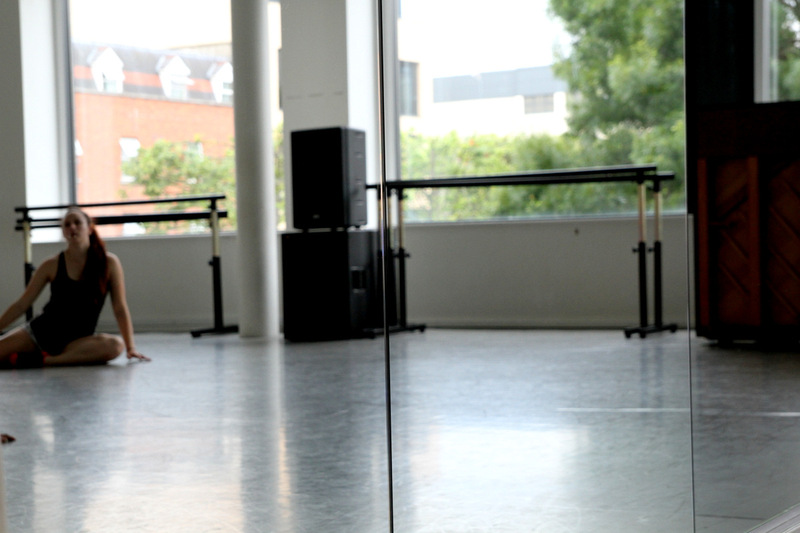 Dancers here rarely, if ever, have long-term contracts; nearly every dancer is a freelancer. 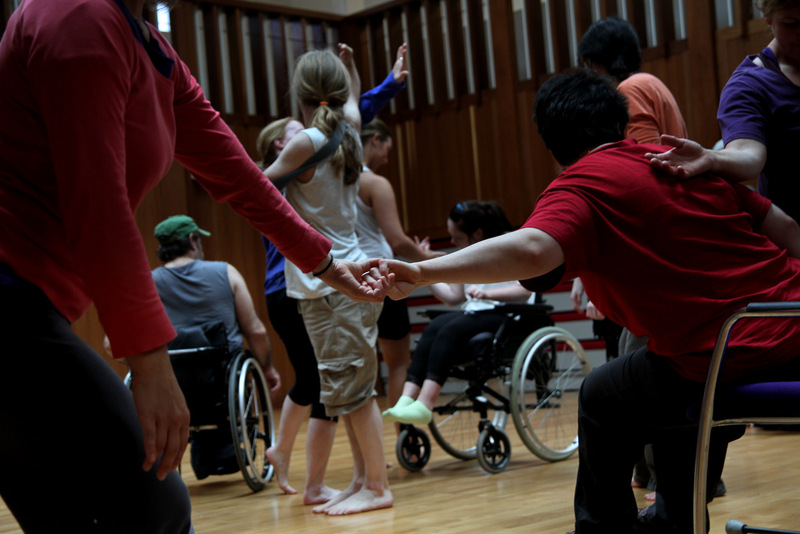 The MeetShareDance workshops I observed included people who stand on two legs and people who use wheelchairs. There was a person who does not see, a person who uses crutches, and a person whose body contracts involuntarily. The beauty of witnessing these dancers moving together, and the “quality” of their performances, for me personally, was undeniable, and should not be assessed by musicality, precision of movement, alignment, or push-up performance as it is described by the conventional paradigm. Such experiences have afforded me the opportunity to rethink how I might handle my data, allowing it to speak for itself rather than forcing it into an evidence-based framework. Though it is tempting to abandon the literature and work from a purely GT approach, there is value in patterns, statistical significance, and generalizability. AC as defined by positivist literature might be true in some regard and under specific circumstances, as too is AC as defined by inductive inquiry. There is little benefit in simply tossing good research aside. Emerson, Fretz, & Shaw acknowledge that GT is not entirely possible in coding ethnographic data because axiological assumptions of the researcher are present in the way she puts down her field notes. Open coding is only true in the sense that it is an unfiltered pass at notes that have been gathered and recorded through the researcher’s filter. Emerson et al. suggest an additional pass of “focused coding” once themes begin to emerge. What might arise from the data if I were to use both methods: a pass of coding according to themes established by the literature, and another pass free from any obligation toward it? What could come from that process remains to be seen. H. Russell Bernard (2006) describes varying ways of conducting ethnographic research, ranging from that of complete observer to complete participant. A blend of the two, participant observation, is a commonly used method for capturing data in ethnography. Being a former dancer, I had the capacity to participate, but I chose to observe. My choice to enter the field as an observer was deliberate, triangulated by using a variety of methods and two co-investigators. The experience of the observer is different from that of the dancer, yet equally critical. After all, who are we creating dances for? Ourselves, certainly, but as an aesthetic and often presentational practice, dance relies on its audience for interpretation, intellectual discourse, and for some, validation. Drawing from Authentic Movement. Developed in the 1950’s by Mary Starks Whitehouse, Walden (1998) describes Authentic Movement (AM) as an improvisational movement practice, the goal of which is to move subconsciously, free from any association and intention, in the presence of a witness. In her dissertation exploring the use of AM as a qualitative research tool, Walden (1998) writes that AM is based on “the theory that all movement is inherent in and reflective of a person’s authentic self” (p. 2). As with AM, evaluative statements are discouraged to maximize the potential for interpretation and minimize, or at least manage, personal biases and pre-conceived notions about the artwork. There is evidence in the literature that VTS can lead to improved observation skills (Klugman, Peel, & Beckmann-Mendez, 2011); and empathy, awareness, and sensitivity to art in medical and human science educational settings (Reilly, Ring, & Duke, 2005). Future study might utilize strategies from AM and VTS to elicit reactions to movement and photographs of movement using semi-structured interview prompts to investigate what is seen by a variety of observers. Though I was initially set on using direct observation as a research method (described above), additional conversations with Kono-Pohlmann encouraged me to consider the value of participation. We discussed an ongoing debate in the dance community regarding my role as a dance critic. I had been told by dance reporters in 2011 as I was entering the field that it was not possible to participate in the dance community and remain an objective reporter. Kono-Pohlmann disagreed. “You have to test your opinions in the studio,” she said. As this work continues, future research sites in the U.S. include professional dance companies with contracted dancers, making participant observation nearly impossible. Dublin, however, has few companies that operate under this structure. Many, if not most dancers work project-to-project, which provided more opportunity for participant observation as a method of data collection. The question remains whether observation or participant observation is the ideal way to collect ethnographic data in dance, but perhaps it doesn’t matter. The exchange that takes place between dancers and their audience is a “two-way street,” thus the role of the observer is, indeed, participatory too. In addition to observation and participant observation, methods such as interview, photoelicitation and Visual Thinking Strategies, and movement interpretation using Authentic Movement practice complement the data (described in part by this essay). By triangulating ethnographic data through multiple investigators serving in participant observer and observer roles and employing a variety of research methods, the potential impact of inductive, qualitative research in expanding the literature on AC is quite great. Angioi, M., Metsios, G.S., Twitchett, E., Koutedakis, Y. & Wyon, M. (2009). Association between selected physical fitness parameters and aesthetic competence in contemporary dancers. Journal of Dance Medicine & Science, 13(4), 115-123. Bernard, H. R. (2006). Participant observation. Research methods in anthropology: Qualitative and quantitative approaches (4th ed.) (pp. 342-361). Lanham: AltaMira Press. Koutedakis, Y., Hukam, H., Metsios, G., Nevill, A., Giakas, G., Jamurtas, A., & Myszkewycz, L. (2007). The effects of three months of aerobic and strength training on selected performance- and fitness-related parameters in modern dance students. Journal of Strength and Conditioning Research, 21(3), 808-812. Chatfield, S. J. & Byrnes, W. C. (1990). Correlational analysis of aesthetic competency, skill acquisition and physiologic capabilities of modern dancers. 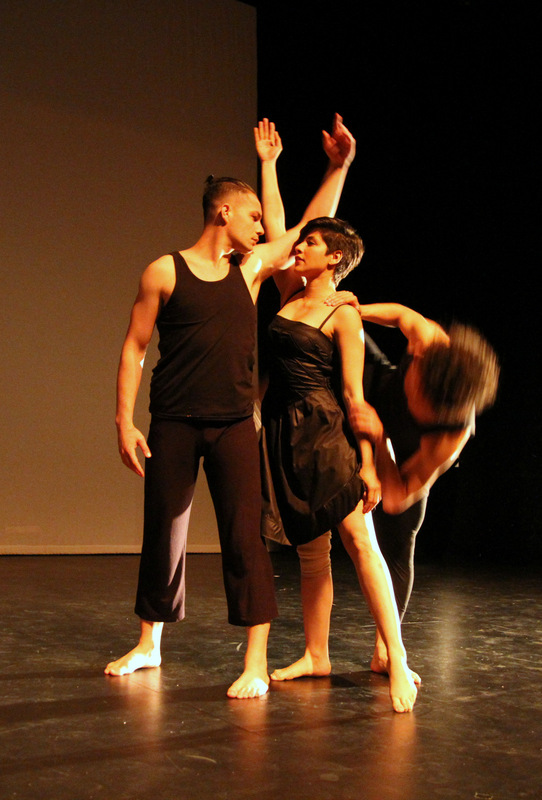 5th Hong Kong International Dance Conference Papers, 79-100. Chmelar, R. & Fitt, S. (1991/1992). Conditioning for dance: the art of the science. Kinesiol Med Dance, 14(1), 78- 94. Creswell, J. W. (2013). Qualitative Inquiry & Research Design: Choosing Among Five Approaches(3rd Ed.). Thousand Oaks, CA: SAGE Publications, Inc.
Emerson, R. M., Fretz, R. I., & Shaw, L. L. (2011). Writing Ethnographic Fieldnotes (2nd Ed.). Chicago, IL: The University of Chicago Press. Klugman, C. M., Peel, J., & Beckmann-Mendez, D. (2011). Art rounds: Teaching interprofessional students visual thinking strategies at one school. Academic Medicine, 86(10), 1266-1271. Knudson, D. V. (2013). Qualitative diagnosis of human movement: improving performance in sport and exercise. (3rd Ed.). Champaign, IL: Human Kinetics. Krane, V., & Baird, S. M. (2005). Using ethnography in applied sport psychology. Journal of Applied Sport Psychology, 17(2), 87-107. Krasnow, D. & Chatfield, S. J. (2009). Development of the “performance competence evaluation measure” Assessing qualitative aspects of dance performance. Journal of Dance Medicine & Science, 13(4), 101-107. Musicant, S. (1994). Authentic movement and dance therapy. American Journal of Dance Therapy, 16(2), 91-106. Parrott, A. A. (1993). The effects of Pilâtes technique and aerobic conditioning on dancers’ technique and aesthetic. Kinesiol Med Dance, 15(2), 45-64. Pokora, S. L. (1988). An investigation of imaging as a facilitator for the development of the dancer. Masters Abstracts International, 27(3), 318. Reeves, S., Kuper, A., & Hodges, B. D. (2008). Qualitative research methodologies: ethnography. British Medical Journal, 337(7668), 512-514. Reilly, J. M., Ring, J., & Duke, L. (2005). Visual thinking strategies: a new role for art in medical education. Fam Med, 37(4), 250-2. Walden, L. P. (1998). Authentic Movement: A phenomenological method with implications for dance, pedagogy, and qualitative research (Doctoral dissertation). Retrieved from ProQuest Dissertations and Theses. (Accession Order No. AAT 9826207).